Our Hostel is located in the downtown area, close to the International Train Station called Keleti Pu. An ideal place for your crawls in the City, surrounded by lots of pubs, restaurants, cafes, nightclubs, a post office and 24 hour grocery shops and all important things you might need during your stay in Budapest. The very central location and the proximity to the underground stations and numerous tram and bus lines make Locomotive Light Hostel a prime choice for those looking for convenience and comfort. Surprise yourself and your partner with something nice and special, enjoy your rest in our romantic four-poster beds! We offer you single rooms, double rooms, four bedded room and a six bedded ensuit room, all rooms with a really pleasant atmosphere. After a hard day or a hard night you can watch SAT-TV from the comfort of your bed as there is televison in every rooms. We offer you a newly renovated mixed ensuit dormitory (6 beds) with an own bathroom. There is an equipped kitchen in the Hostel, you can find there a stove, fridge, freezer, microwave owen, coffee machine, toaster, turmix machine, dishes, plates, etc..., drink coffee, tea and cacao, as much you like, for FREE ! Other food and drinks you can buy downstairs in the nonstop supermarket. We provide you 24 hours Free Internet access, Free WiFi and PC. 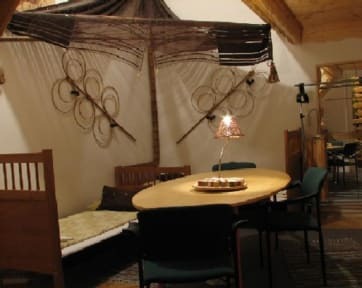 The common room is also well equipped and well decorated, helping to provide an easygoing atmosphere where you can make your stay fun and memorable. We offer you a cheap airport pickup and free pickup from the train station. Book your bed or your room and come, come ! Nice and cosy place. Very good location. Small hostel which is very close to the Budapest Keleti train station, but about a 40 minute walk to the city center. When I arrived, I was assigned to a 6-bed dorm which had three men in it already. I went out for a while, and when I returned, the staff moved me to another room where I was the only girl - I really appreciated this! The bathrooms were clean, and the lockers were good in the first bedroom, but I could not find any lockers in the second bedroom which I was moved to. The flat we stayed was very clean and tidy, but it was around 10 minutes walk from it says in the web site and Above 3 diferente bars and pub, with make it really hard to sleep on a friday night. ”Amazing location if you have an early morning train to catch. Make sure to read ”how to get here” as it can be a bit difficult for some people.The guy working in the reception is very kind and happy to answer questions. Equipped kitchen and nice rooms. Not really a common room so perfect for just a place to sleep. Quite hostel in a less touristic area of town. Acceptably clean and comfortable but no atmosphere and kinda grumpy staff. Hard to find at night, there are definitely much better hostels in Budapest. I chose it because it was near one of the train stations but I regret it. I only stayed here one night. The beds are bad, the pillows are full of lumps, the general set up is not great. It’s not easy to locate either. The hostel was good in terms of accommodating my late arrival. Other than that , there isn’t much going for it. No common area to speak of and the internet is patchy. 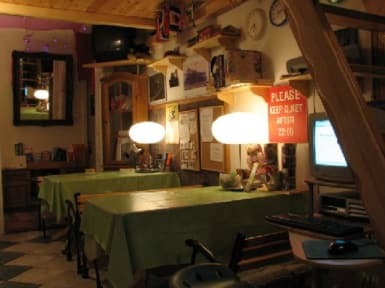 There are many other hostels in Budapest to choose from. Staff is rude, unfriendly. The room was not in the hostel but in 15min walking time so we were in a completely different neighbourhood than planned. There was no running water in the whole apartment. The apartment was ok though. All in all I don't recommend this hostel even for 1 night.